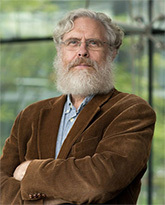 George M. Church, PhD '84, is a professor of Genetics at Harvard Medical School, a founding member of the Wyss Institute, and director of PersonalGenomes.org, the world's only open-access information on human genomic, environmental, and trait data. George is known for pioneering the fields of personal genomics and synthetic biology. He developed the first methods for the first genome sequence and dramatic cost reductions since then (down from $3 billion to $600), contributing to nearly all "next-generation sequencing" methods and companies. His team invented CRISPR for human stem-cell genome editing and other synthetic biology technologies and applications - including new ways to create organs for transplantation, gene therapies for aging reversal, and gene drives to eliminate Lyme disease and malaria. George is the director of the IARPA and NIH BRAIN projects and the National Institutes of Health Center for Excellence in Genomic Science. He has coauthored 450 papers, 105 patents, and one book, Regenesis. His honors include the Franklin Bower Laureate for Achievement in Science, the Time 100, and election to the National Academies of Sciences and Engineering.